For World Mental Health Day we wanted to share this fantastic project funded by the Green Exercise Programme as part of Our Natural Health Service which has been written by TCV’s Alis Balance Senior Project Officer. 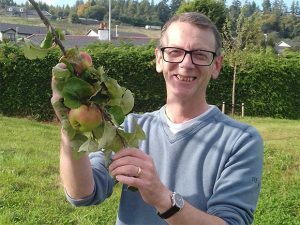 Out in the new orchard at New Craigs Psychiatric Hospital where I work for TCV as Greenspace for Health Senior Project Officer, I am delighted to see so many bright rosy apples shining in the trees. There’s an October harvest sun and I’m getting ready to take a Green Gym with some patients and outpatients among the fruit trees. I meet everyone at the neighbouring Occupational Therapy Garden which has newly been restored for us by the Community Service Payback Team. An occupational therapist has brought along two new participants. One of them looks like he wishes he had not left the ward. He is huddled over, stooped, disengaged. He does not want to talk. He is only young, in his twenties, but looks like he has suffered through several lifetimes. I introduce everyone to each other and explain to the new participants how the green gym will work, that we will do a gentle warm up and wind down and carry on with some tasks in the garden, including painting the shed with a second coat of blue, while the weather is dry. The young patient sees a way out. His occupational therapist has not told him we might be painting today. He is wearing his best clothes so announces he cannot paint. He will go back in. Now. Quickly I mention our other planned activity for the day. His posture changes and his gaze lifts slightly as I mention the new Orchard. No one in the group has been to the Orchard, so we walk round there together, with the empty bags and basket I have brought in anticipation. All of us except the troubled young man start to get closer to the trees, taking the easy fruit from the lower branches quickly first. Maggie notices the details as always and is curious about the apple varieties. Maggie has the wisdom of her years, partly because she never loses her youthful fascination for new knowledge. Slowly the young man is approaching the trees. He questions whether he might just shake a tree to get the apples down. He tries this, timidly at first, then soon is laughing as every so often an apple lands on his head. Now he is moving from tree to tree, gathering more apples than any of us. He (over)fills a couple of large bags. Suddenly I see a movement in the grass and spot a frog. I tell everyone, and while the others nod their interest and carry on picking apples, the young boy moves over quickly to look at the frog and crouches down to get closer to it. He reaches over gently to pick it up but it hops away through the hedge and out of the hospital grounds where the boy is not allowed to follow. From now on the boy is animated, friendly, wants to come back to the next Green Gym, wants to know what other outdoor activities I offer. He will aim for Branching Out, a programme introduced by the Forestry Commission Scotland to enhance mental health and wellbeing via a varied programme of forest activities. For now he will attend Outsider Decider, an outdoor addition created by the New Craigs Greenspace for Health project, to the NHS self-management programme for those with mental health issues, which enables each person to decide which response to make to stress. He leaves with the occupational therapist to go back to his ward then returns 5 minutes later to talk more about the Greenspace projects and linger in the garden. In 2007, NHS Health Scotland, Forestry Commission Scotland and Scottish Natural Heritage established the Green Exercise Partnership (GEP) to promote better health and quality of life for people in Scotland through greater use of the outdoors for physical activity and contact with nature. The GEP works to raise awareness of the range of health benefits that being in and being active in the outdoors can bring, and the contribution that green exercise can make to a Healthier Scotland if it is embraced by the health and social care sector.